Several years ago – actually, it may have been twenty! – there was a message on our voicemail from a neighbor to let me know that he had seen four eagles on his rooftop. Trying to imagine what he had seen – the birds must have been dark and large, but they certainly were not eagles on a Barrington Hills rooftop – I realized he had seen four turkey vultures. They are roughly the size of eagles, dull black all over, and have a posture when they roost not entirely unlike that of eagles. Turkey vultures were not common around Barrington twenty years ago and I guessed that our neighbor decided the only species of that size had to be an eagle. When we came to Barrington in the mid-70s, there was nary a vulture to be seen. Robert Ridgeway’s Birds of Illinois cites a Mr. Nelson, writing about the “turkey buzzard” in his 1876 list for Cook County: “A very irregular and rare visitant in this vicinity”. 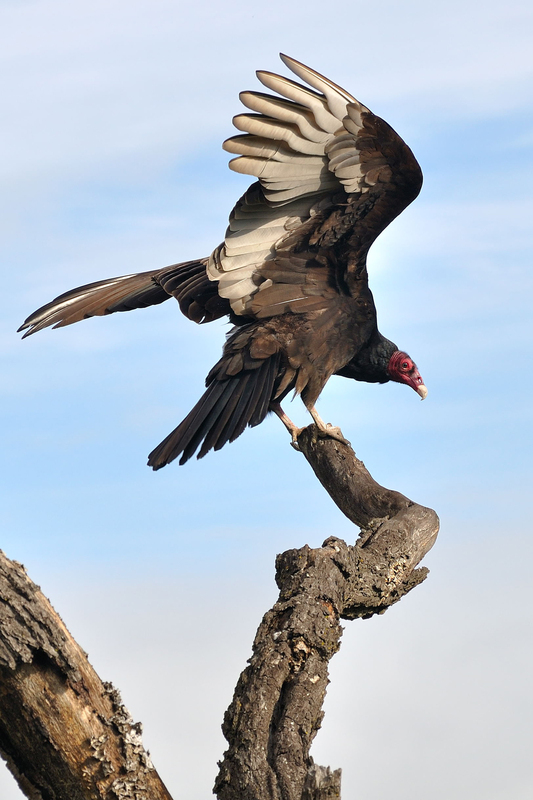 The more recent (1984) book by Steve Mlodinow, Chicago Area Birds, claims that turkey vultures are common only in the southernmost counties of the Chicago area. I’m not sure when I began noting them regularly in flight over the Barrington area, but I think it was around the mid-‘90s. The species has moved steadily northward and today, from early spring to November, turkey vultures float over local towns and countryside. Late September and October are good months to look for them as they prepare to migrate south. A turkey vulture (Cathartes aura) is quite easy to distinguish in flight from a red-tailed hawk and other raptors. While the wide-winged red-tail soars, the vulture floats. It holds its wings slightly above a straight horizontal, in a modified V called a dihedral. The wingspan is wide – 6 feet – the head small, and the tail considerably longer than that of its cousin, the black vulture, which still confines its range to more southern parts of the country. The vulture’s flight is erratic for good reason. It is searching for carrion, its major sustenance. On a bike ride in late September, I spied ahead a turkey vulture atop an opossum that had been killed on the road. The vulture was performing its essential role in consuming dead animals, as part of nature’s clean-up crew, just like its many cousins around the world. 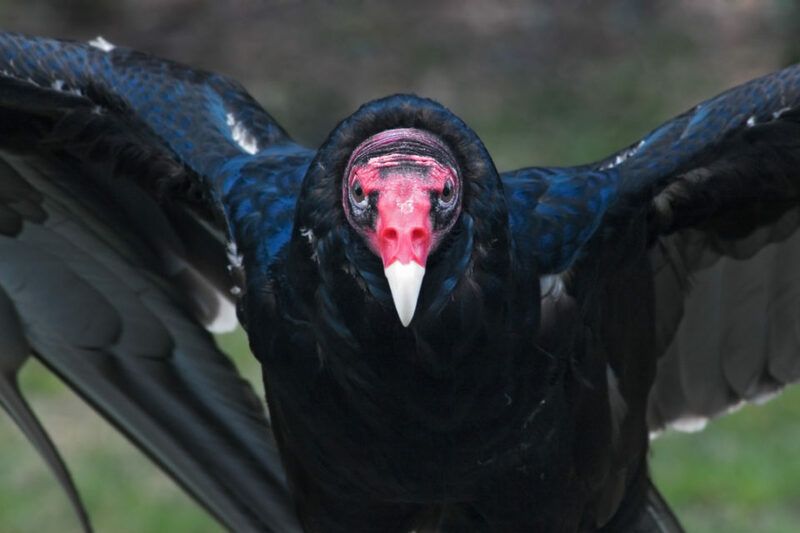 Unlike many of the old world vultures that have been in steep decline from increased use of lethal drugs in combating bovine diseases, the turkey vulture of the New World is thriving and, in fact, increasing. Some scientists speculate that the growing number of highways, cars and, subsequently, animal road kill, is responsible for the increase. On autumn mornings, as breezes pick up, it’s common to see raptors of all kinds taking advantage of the up-spiraling winds, or thermals, and begin their slow, circular climb skyward. Turkey vultures are usually part of the group and it’s a good exercise in long-range identification to try to pick out their slightly v-shaped silhouette from the others. Some will migrate only a short distance to southern Illinois or a bit farther. Others will join a stream of vultures and hawks that heads southward through Central America and becomes a “river of raptors” as it passes above Veracruz, Mexico and the isthmus of Panama. I remember a late October day outside Panama City when we were supposed to be touring the Panama Canal, but I could not take my eyes off the skies where, literally, millions of turkey vultures, black vultures, Swainson’s hawks, and broad-winged hawks were migrating overhead. The turkey vulture’s head of bare, red skin and beady eyes is a face only a mother can love. But the bird’s graceful flight and its important contribution to cleaning up dead animals make it a bird we should know and pay attention to. As you hike in area preserves or even as you walk in town or your neighborhood, cast your eyes aloft and see if you can spot one before it’s gone for the winter. Would you like to explore the Barrington area’s birds with Wendy Paulson? Join Wendy for her 2017 series of fall Bird Walks & Hikes. There are three more on Wendy’s schedule for this season. Walks are free and open to the public though spaces are limited and RSVPs are required. Good walking shoes are strongly recommended for these walks and don’t forget your binoculars! Please RSVP to: Matt Jaccarino (312) 453-0230, Extension 2010 or mjaccarino@audubon.org and let us know how best to contact you should that be necessary. Before you head out, please be sure to check CitizensforConservation.org for any last minute changes or cancellations. During interludes in New York City and Washington, DC, Wendy taught classes about birds in the public schools and is helping to develop a similar program in Chicago public schools with Openlands. She is chairman of The Bobolink Foundation, serves on the board or advisory committee of multiple conservation and bird-related organizations, both domestic and international, and is former chairman of IL and NY chapters of The Nature Conservancy. Wendy and her husband Hank have two grown children and are avid hikers, cyclists, and kayakers. Prev post The Arboretum of South Barrington Art Festival to Debut in October!